Web #708591. This ink set is a Special Edition and will not be around long. 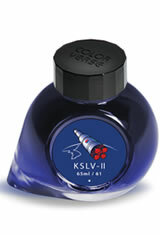 Keeping with the space theme, Colorverse has created this special edition ink to commemorate KSLV-II, a Korean 3-stage rocket used to launch observing satellites. The Colorverse KSLV-II SE(65ml + 15ml) Fountain Pen Ink usually ships within 1 business day unless otherwise specified. Each Colorverse KSLV-II SE(65ml + 15ml) Fountain Pen Ink we sell is guaranteed to be genuine, authentic and will arrive brand new & unused! Love these colors! Great flow.